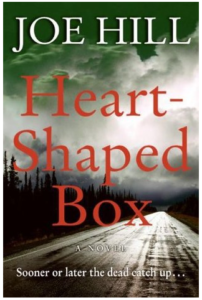 Heart-Shaped Box by Joe Hill is another one of my 5-star reads from this year. I finished up with this one in September and was once again blown away by Hill’s talent. I had previously read his novel, Horns, which has since been turned into a movie starring Harry Potter…..I mean, Daniel Radcliffe. For those of you who have never heard of Hill, he is the richly talented son of my favorite writer, Stephen King. Is writing genetic? Possibly. In this one, we meet Judas Coyne, an aging rock star who has a penchant for younger women and collecting obscure, macabre items. This odd hobby (the item collection, not the younger women) brings him to buy a dead man’s suit and thus it begins – a gritty ghost story that grabs you from the very first chapter. I could not put this one down once I started. Joe Hill is such a fantastic writer – he writes with such persuasion and conviction that you find yourself believing what the narrator is telling you, no matter how dark. You can dive right into this one and never look up if you allow yourself. This was so creative and fast-paced and I thoroughly enjoyed every minute! As a side note, I am currently reading Hill’s novel, NOS4A2 (which is a wonderful Christmas time read), and it is proving to be my favorite of his works thus far!! If you like dark, you have to read Hill!